The previous day’s endeavours had us sleeping in rather late, relinquishing every single minute of the morning, drawn to the comfort of our beds at Loveli Boutique Guesthouse. This was our last morning in Phuket, by the way. A far cry from the congested, with bodies laid bare (literally) on the tanning beds the day before …. The world wakes up at 11am-ish in Patong of Phuket, it seemed. 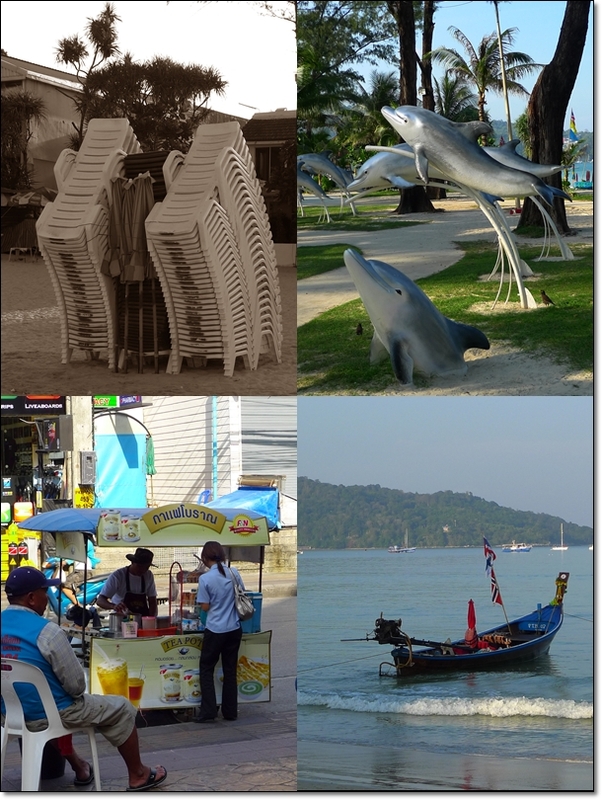 A stroll around town revealed that even the locals in Patong do not practise an early to bed, early to rise concept. Completely understandable, given the rather ‘notorious’ moniker accredited to Patong as THE epitome of nightlife in Phuket. It was already about 10am (Thailand time, 11am Malaysian time) and yet the beach boys manning the stretch of beach beds and the masseurs plying the same route were barely up and running, judging from the pace they were setting up their respective businesses. breakfast of half-boiled eggs, and Thai milk tea. 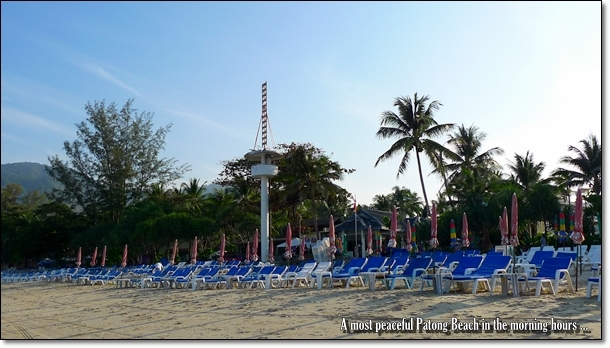 Indeed, Patong beach during the day is a far cry from its glitzy, even sleazy self come the darker hours of the day. Searching around for breakfast in town as mentioned in the last post, was not an exactly easy task, given the widespread commercialization, hence the sprouting of various fusion cafes, not-too-authentic Thai breakfast outlets (spaghetti and Pad Thai on the same page, anyone?) and the usual suspects of Subway, McDonald’s and Burger King with their ever-tempting inclusion of PORK in the menu. Thankfully, we spied on a few shacks (yes, can’t even name them as shops, nor outlets) situated by the roadside directly opposite of Jungceylon Shopping Centre. Bear in mind this is the portion that faces towards the land/mountains instead of the beach. Or the entrance next to the 24 hours McDonald’s. A meal for five came to 225 baht/ RM22.50 / USD6.40. The noodle soup came in a much generous portion, with lots of greens (even ‘kangkung’ or morning glory, a rare addition in the versions served up north), and a choice of chicken or pork. Of course, you can choose to have your bowl of soup with the thinner strands of rice vermicelli, or the thicker version, or even the flat version. Almost akin to our Koay Teow, the chewy pieces of flat rice noodles reminded me of Pan Mee at times, but their rendition of the fried noodles failed in tantalizing our tastebuds. The grilled pork belly was a health freak’s nightmare came true. The layer of fat was almost overwhelming for some cuts, but lent a most balanced flavour to the freshly grilled cuts of pork. A slab at only 50baht, it was priced somewhat in proportion to what the average Char Siew seller serves here in Malaysia. The accompanying plate of piquant, tangy chili sauce with fresh coriander was a nice complement to the meat. Do ignore the surroundings, if you ever wish to have your breakfast here. Esanlabkhom Inter may be the shop’s name. We packed up, and got ourselves ready to leave Phuket. From our guesthouse to the Phuket bus station, we chartered a van for 500baht / RM50 / USD14.30. Before you go thinking … WAH, so expensive?! Note that even the average tuk-tuk plying the streets charge almost the same amount, and the journey took about 30 minutes from Patong to Phuket town. 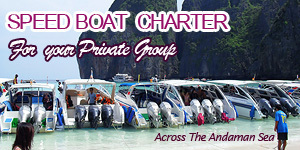 That’s just commercialization for ya …… We took a van instead from Phuket to Krabi, instead of the bus ride which took us an astounding 3.5 hours, and for an even pricier offer. Per person, the 2.5 hours ride in the van cost only 120 baht/ RM12/ USD3.40. You can buy the tickets at the Phuket Bus Station itself, at one of the booth there. The shorter journey was a much grateful option, for we saved a whole hour to check into our hotel, and for a light lunch. 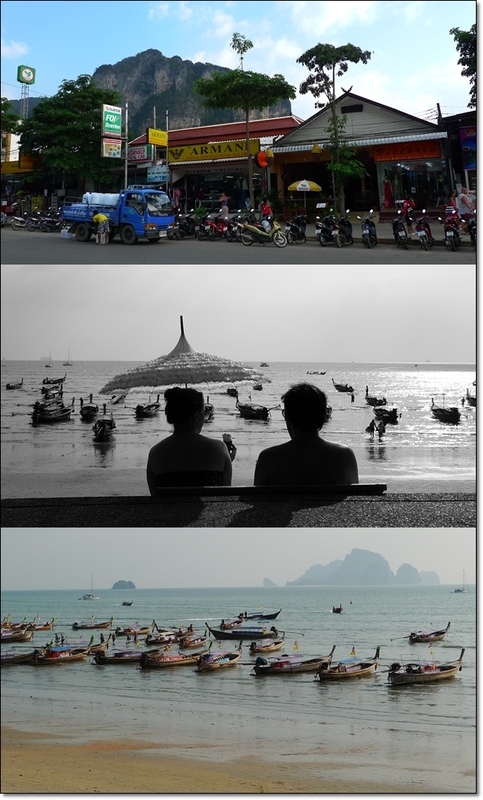 Arriving at Krabi Bus Station, we took a taxi to Ao Nang beach where we stayed for the remaining days. 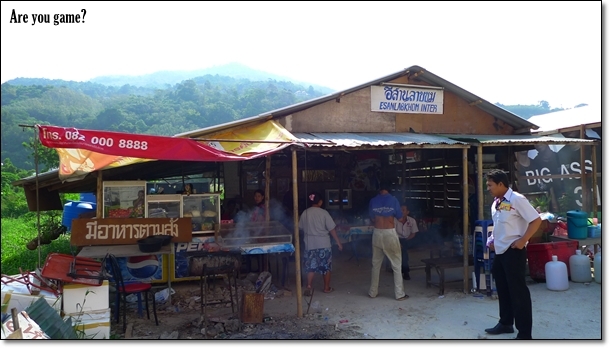 But at the Krabi Bus Station, we were ‘ushered’ to the Tourism Information & Restaurant outlet at the back of the station. There, we met a rather helpful (notice the word ‘rather’ – everyone’s out for some business aka no free lunches in the world, right?) lady who explained to us that the hotel we booked, named Ao Nang Pearl is situated at a rather distant location from the beach. Which is true, by the way. The hotel is at least a good 1.5km away from the beach !!! To which she ‘kindly’ made some calls, and we ended up at Ao Nang Grand Inn. 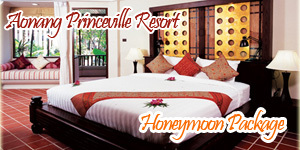 A double room for 1300 baht / RM130 / USD37, and a family room which can fit 4 pax for 1600 baht / RM160 / USD45.70. Slightly more expensive than what we bargained for at Ao Nang Pearl, but at least Ao Nang Grand Inn is located at the prime location, about few minutes walk to the beach. And trust me, you won’t regret staying near to the beach, for the abundance of food outlets, hawker stalls, and convenience stores made everything so smoothly for us. is on the high side. Hence, you’ll probably have a better time searching for a pancake than say …. a Pad Thai stall. 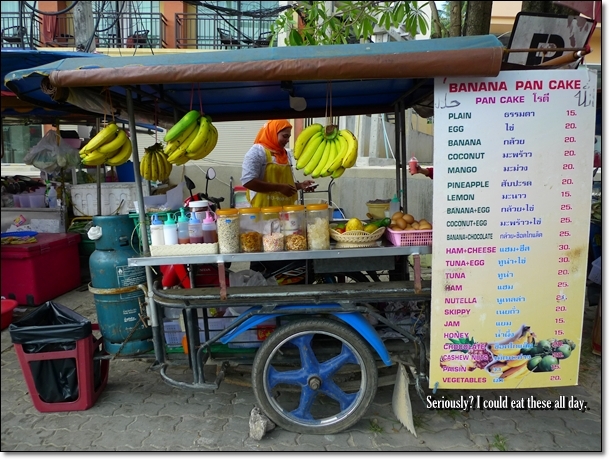 If you’re in Krabi or Phuket, one of the not-to-be-missed street food has to be the pancakes, or Muslim style pancakes to some. 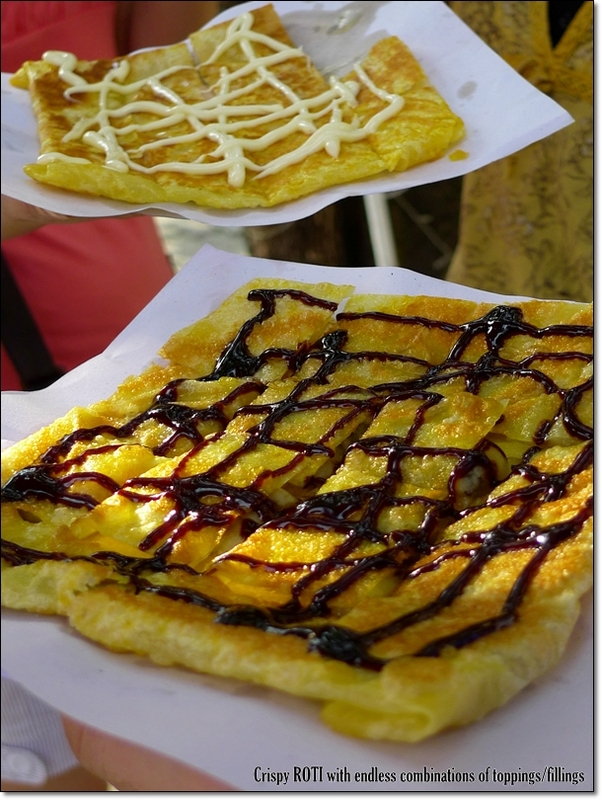 For us Malaysians, the pancakes might be mistaken for Roti canai with fancier fillings, which is partly true. But the crispy layers of crepe (?) enveloping the fillings of your choice, pan-fried lightly then served on those thin, blotter paper (whatcha call them anyway?) ….. Heavenly. And the endless combinations of fillings/toppings, from Nutella to Chocolate/Banana, as well as Honey and Jam, to even savoury ones such as Tuna/Cheese and Ham/Cheese, was just but one of God’s cruel trials to gauge a person’s self-control. And how we failed, with flying colours. 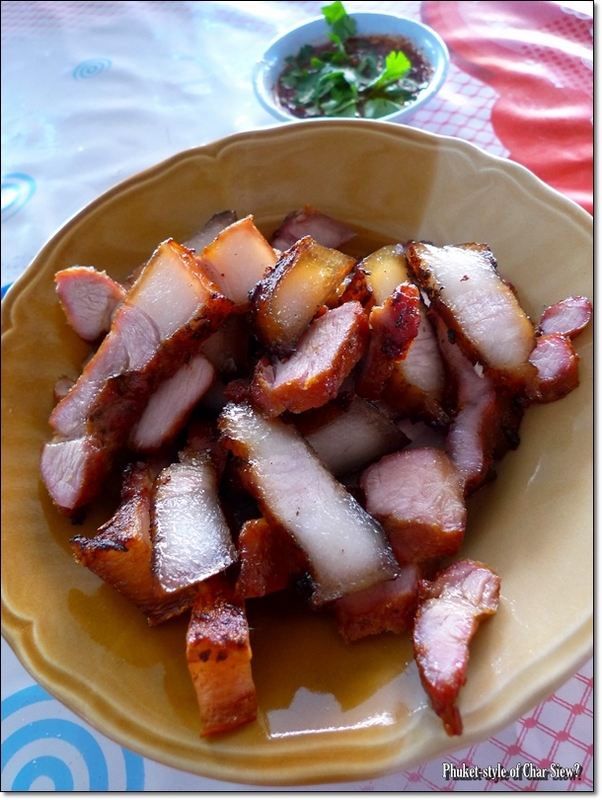 Ayam Percik, Thai-style, to be served with glutinous rice – Breakfast, Brunch, Lunch od Dinner also can. 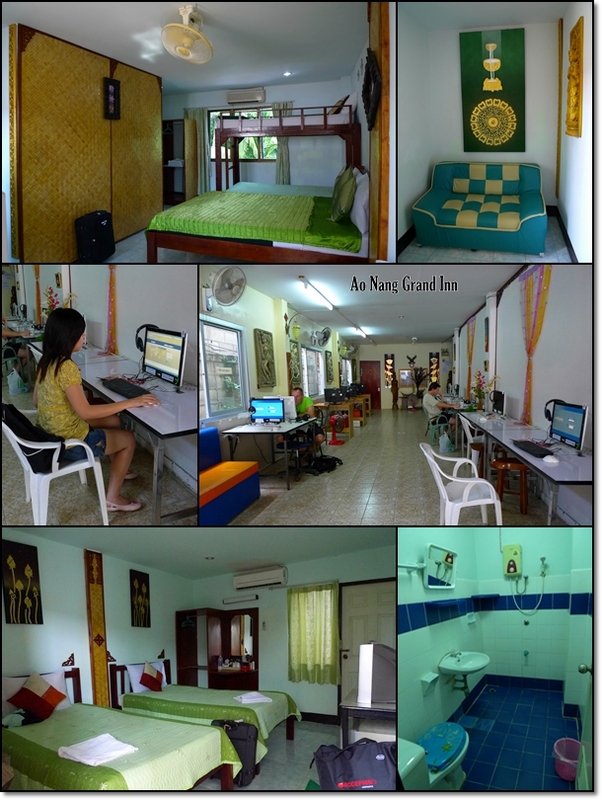 Ao Nang Grand Inn – A blink and you’ll miss this sort of budget guesthouse, on the main road of Ao Nang. Opposite Bangkok Bank/Mc Donald’s and 7-11, which in turn houses the stretch of hawker stalls that run from morning until night. It was indeed a wise choice to be staying nearer to the beach, for that’s where all the action was. Walking around Ao Nang is a most relaxing activity, without the hustle and bustle of ‘seedier’ towns (Patong comes to mind, naturally), and at a most leisurely pace. 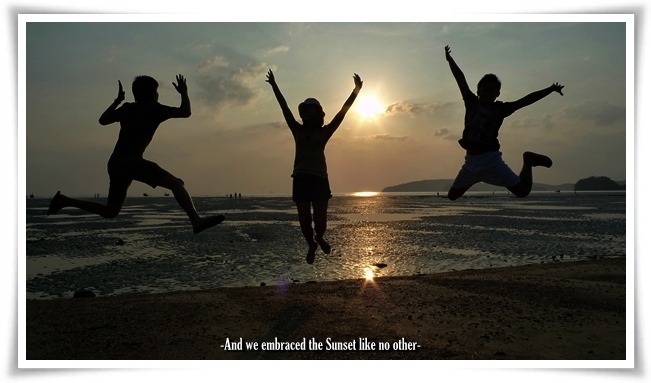 Yes, some might argue that Ao Nang beach is the commercialized portion of Krabi, but still ….. we felt almost otherwise. How about Thai style of traditional massage and such from only 200 baht / RM20 / USD5.70 per hour? 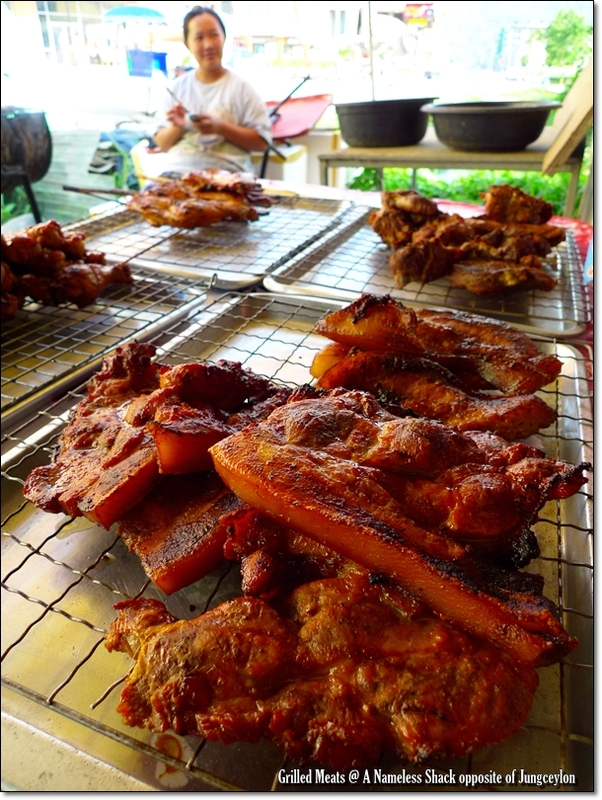 And restaurants that serve all-you-can-eat BBQ buffet (with ribs, prawns and such) at only 250 baht / RM25 / USD7 per person? 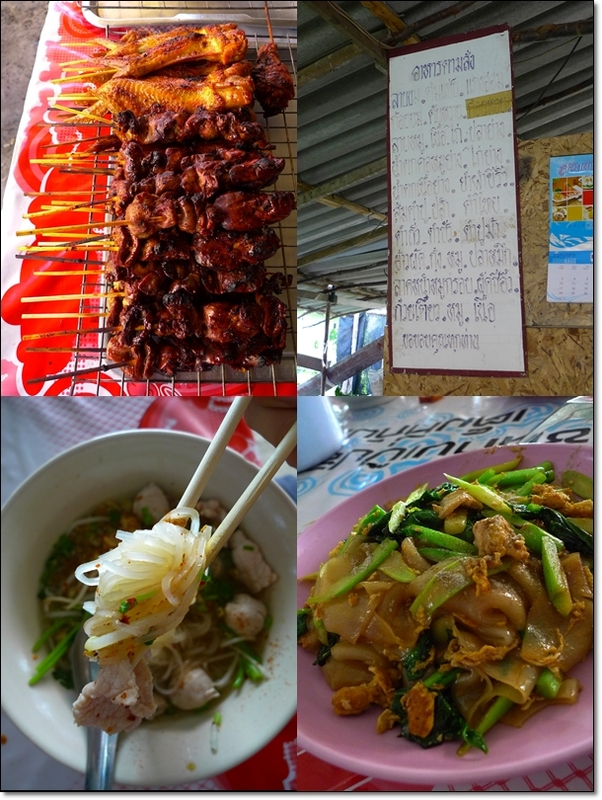 Oh, not forgetting the reasonably-priced street foods, whereby one can have a full meal for 50baht / RM5 / USD1.40 or less? 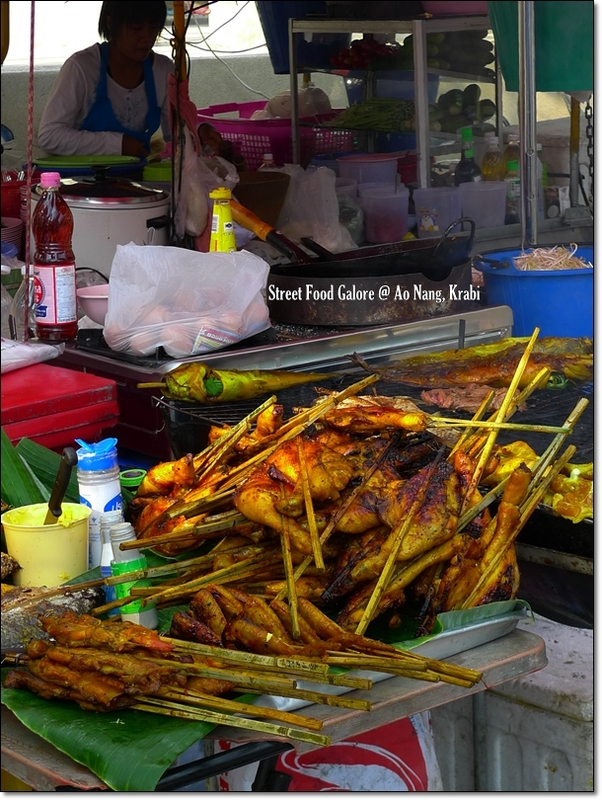 Of course, there are way, way more street foods in Krabi town, especially at the night markets (no thanks to Precious Pea who had repeatedly poisoned me prior to the trip! Hehe, thanks Pea!). But realize that from Krabi town to Ao Nang beach, it’ll take you about half an hour, and roughly 50-60 baht per person per way, on their bus (which is a larger tuk-tuk, or songthaew like those in Chiang Mai). Your call, definitely. His name’s TON. Or something like that. But he’s affable, honest (okay, as honest as a tour agent can get), and ever so helpful. And we resisted gravity like floating butterflies, NOT.